There is no way to discuss Heroes in Crisis in detail without some fairly significant spoilers. So I’m going to break my usual format for my reviews and give you my blunt and unrestrained opinion at the start, before I describe how I formed that opinion. And that opinion can be summed up in a single sentence. Heroes In Crisis is the single biggest betrayal of the idealism that lies at the core of the DC Comics multiverse since Identity Crisis and the single most flagrant example of false advertising since the Batman/Catwoman wedding issue earlier this year. It’s a shame the story is so terrible, because the artwork by Clay Mann is beautiful. Yet a pretty face cannot mask an empty heart and this comic has nothing where it counts. SPOILERS to follow, after the image. You have been warned. The early promotional materials for Heroes In Crisis were built around the concept of Sanctuary – a secret trauma center for superheroes that allows them to privately seek mental health treatment for the unique kinds of PTSD that one develops when you’re the last surviving member of an alien race or you develop disassociate identity disorder because of your secret identity. It was reported that writer Tom King – a former CIA operative – got inspired by the stories of the problems encountered by soldiers returning home from overseas and decided to write a story around the concept of Sanctuary as a metaphor for the real issues our real-life heroes cope with. It’s a noble sentiment, but Heroes in Crisis is not the M*A*S*H*-style examination of medical treatment in war-time we were sold in the early solicitations. Nor is it a murder-mystery centering around the death of a hero in Sanctuary that the later promotions suggested, complete with a list of odds as to just which character would be the one to die in the article in DC Nation magazine. 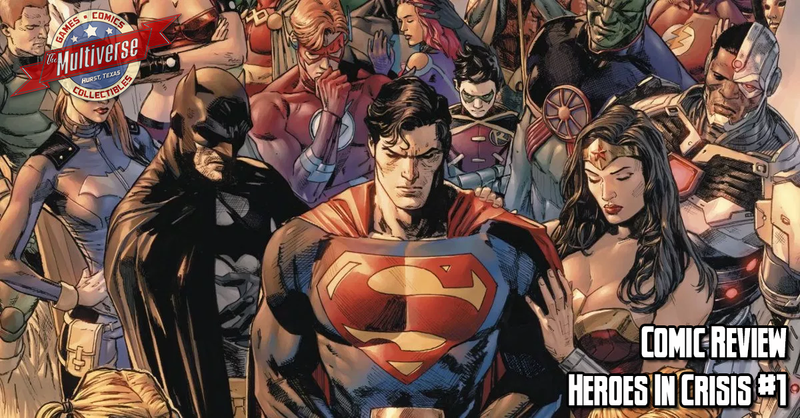 The shocking twist of Heroes in Crisis is that there is more than one victim. Everyone in Sanctuary is killed and the apparent killer is revealed on the final page. Of course it’s unlikely to be that simple, with eight more issues to go in this series, but I defy anyone to see any reason to care about the ultimate mystery given the cynicism with which the audiences were played by the advertising for this series. Now, I know what you’re thinking – don’t people die in comics all the time and come back to life eventually? Yes, which makes it all the more offensive that they would try and pull that play in a book that was advertised as a realistic, grounded portrayal of how difficult it is for heroes to heal in the face of tragedy. I find it particularly vexing given that one of the few identified fallen heroes in this issue is Roy “Arsenal” Harper. This is because Roy is one of my favorite comics characters of all time and I haven’t been happy with the way he’s been written for the better part of a decade. Even before The New 52 revamp back in 2011, everything that made Roy Harper interesting and unique as a character (i.e. White kid raised on a Navajo reservation, single father, etc.) was discarded in The Fall of Arsenal, in favor of turning Roy into a one-note character whose one note was “recovering junkie.” Benjamin Percy finally gave Roy the respect (and backstory) he deserved in the pages of Green Arrow, only for all of that to be junked here, as Roy is once again viewed only in terms of his battles with addiction for one page, before being unceremoniously killed off-panel. It makes the whole thing feel like a waste of time and effort. Ditto the death of Wally West, whose recent troubles in The Flash (long story short, he lost his wife and children due to reality being rewritten) have touched me more than any other story this year. All that potential wasted again, for the sake of luring in all the Flash fans who were told Wally’s story would continue in this book after he was sent off to Sanctuary in the pages of The Flash. And there’s the rub of this book – his story will probably continue. Somehow. Given that Booster Gold is involved, the solution as to how to fix all this is immediately apparent. But using time travel to erase the events of a story (as King did with a story involving Booster Gold in Batman recently) just eliminates any sense of drama the murder mystery is meant to evoke. There’s no sense of King’s stated purpose in this book. No examination of the pain of heroes and the sacrifices those who serve make for the sake of others No grand mystery to be solved. There is only death for the sake of publicity and making a quick buck. This isn’t a comic book – it’s a superhero snuff film on paper. 4/10. And that’s purely for the artwork. Heroes In Crisis #1 releases on September 26, 2018!